Back in 2010, I posted some fascinating (at least to me) data on the underlying differences between conservatives, liberals, and libertarians. That same year, I also wrote about whether evolutionary history helps explain why some people are leftists. Let’s now reexamine the difference between those on the right and those on the left, based on some data in a fascinating report from the Chronicle of Philanthropy on the generosity of 359 cities in America. It turns out that “red state” America is far more generous than “blue state” America. I was thinking of writing about the implications of this new research, but I found out that somebody else beat me to it – and said everything I could possibly say. Here’s some of what Jeff Jacoby wrote about this study. According to the Chronicle, the most generous city in America is Provo, Utah, where residents typically give away 13.9 percent of their discretionary income. Boston, by contrast, ranks No. 358: In New England’s leading city, the median household donates just 2.9 percent of its income to charity. Provo’s generosity is typical for its region. Of the 10 most generous cities in America, according to the Chronicle’s calculations, six are in Utah and Idaho. Boston’s tight-fistedness is typical too: Of the 10 stingy cities at the bottom of the list, eight are in New England — including Springfield (No. 363) and Worcester (No. 364). What’s the matter with Massachusetts? How can residents of the bluest state , whose political and cultural leaders make much of their compassion and frequently remind the affluent that we’re all in this together , be so lacking in personal generosity? And why would charitable giving be so outstanding in places as conservative as Utah and Idaho? The question is built on a fallacy.Liberals, popular stereotypes notwithstanding, are not more generous and compassionate than conservatives. To an outsider it might seem plausible that Americans whose political rhetoric emphasizes “fairness” and “social justice” would be more charitably inclined than those who stress economic liberty and individual autonomy. But reams of evidence contradict that presumption, as Syracuse University professor Arthur Brooks demonstrated in his landmark 2006 book, Who Really Cares . Jacoby summarizes the entire discussion in these two sentences. …this doesn’t mean that there aren’t generous philanthropists in New England. It doesn’t mean selfishness is unknown on the right. What it does mean is that where people are encouraged to think that solving society’s ills is primarily a job for government, charity tends to evaporate. In other words, statists pretend to be compassionate. And they compensate for their stinginess by wanting to squander our money. The fact that government programs generally hurt the people they’re designed to help seems irrelevant to them. It’s all about good intentions. But only good intentions with someone else’s cash. P.S. If you want a less serious look at the differences between various groups, here’s a funny post on the differences between liberals, conservatives, and Texans. P.P.S. Sometimes people have irreconcilable differences, which is why this post about the right and left getting a divorce is amusing. P.P.P.S. We already know, from this clever video, that rich left-wingers like the idea of higher taxes for everybody else, but conveniently say no when they’re asked to pay more. In August of that year, following the release of the CBO Update, I showed again that the budget could be balanced by limiting spending so it climbed by 2 percent per year. Most recently, back in January after CBO produced the new Economic and Budget Outlook, I crunched the numbers again and showed how a spending cap of 2 percent would balance the budget. I’m happy to say that the new numbers finally give me some different results. 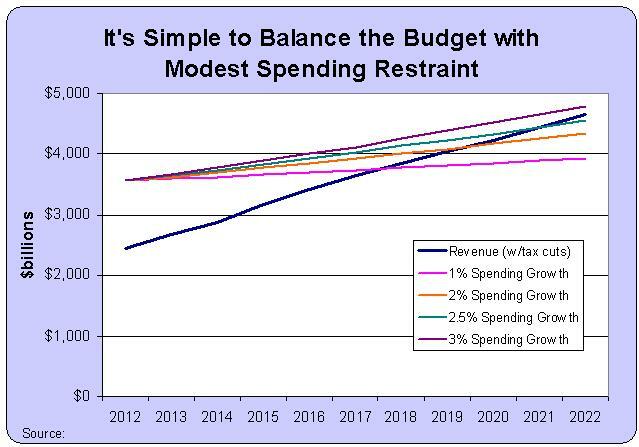 We can now balance the budget if spending grows 2.5 percent annually. In other words, spending can grow faster than inflation and the budget can be balanced with no tax hikes. And here’s the video I narrated almost two years ago on this topic. The numbers have changed a bit, but the analysis is exactly the same. In other words, ignore the politicians, bureaucrats, lobbyists, and special interests when they say we have to raises taxes because otherwise the budget would have to be cut by trillions of dollars. They’re either stupid or lying (mostly the latter, deliberately using the dishonest version of Washington budget math). Modest fiscal restraint is all that we need, though it would be preferable to make genuine cuts in the burden of government spending.